Monday nights at 9:30, CLEAR staff Dennis Okore and advocate Peter Onyango are on air hosting a legal affairs talk show on Radio Nam Lolwe 97.3 FM Kisumu. The radio show began two months ago in partnership with Radio Nam Lolwe which is providing air time free of charge. When CLEAR approached other stations they were asked to pay 200,000 shillings a month, approximately 2000 USD, too high a price for the small non-profit. A community radio station, Radio Nam Lolwe has been highly supportive of CLEAR’s initiative recognizing the need for greater legal awareness. 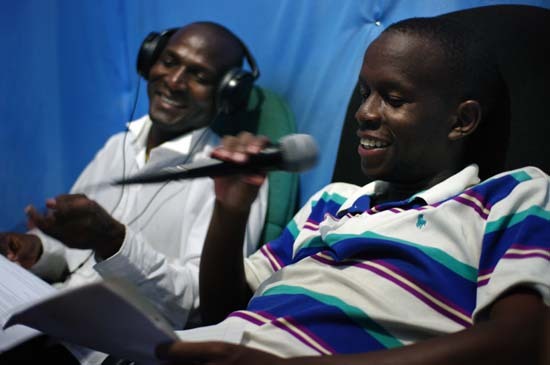 In Kenya, radio is an ideal medium of communication, free and accessible to people in all regions. Moreover, many in the local community do not speak English, and are therefore unable to access daily newspapers. Radio Nam Lolwe broadcasts in Luo, the regional language, and is able to reach those who are often excluded from wider national debate. This Monday’s show discussed the constitutional review process currently underway in Kenya. Kenyans have been attempting to develop a new constitution for the past three decades, a process riddled with controversies and partisan interests. In December 2008, Parliament began the process once again, establishing the legal framework needed to support consensus building. Once a draft constitution is prepared it will be put to referendum and a majority vote will determine whether it is accepted. While the body responsible for preparing the draft is mandated to educate the public on the revised constitution before it is voted on, many Kenyans remain unaware of the proposed changes, the procedure, or how they can participate in the process. CLEAR’s radio program addresses the need for public education on the legal issues which affect Kenyans most. The talk show accepts phone calls at the end of each session, allowing Peter and Dennis to respond directly to listeners.